If you’re like most dog lovers, you worry about your best friend several times a day. Is he lonely without you, and does he have enough to eat? Well, thanks to a 12 year old Shark Tank entrepreneur named Brooke Martin, you can now chat with your dog as often as you’d like with her great invention called iCPooch. It uses a video interface so your dog can see you and hear your voice at the same time. Then, you can reward your dog with a treat at any time. The hookup is two-way, so if your dog, or cat, likes to talk back you can hear them using your smartphone or tablet from anywhere on earth. Here is a quick overview an iCPooch review to help you get the idea of what this great invention can do. The original version of iCPooch was only for the iPhone and Tablet computer, but now there is a free application that also works through a web browser and any desktop or laptop computer. This allows you to keep your best friend happy anytime you aren’t at home. As we all know, our dogs spend most of the day sleeping and wondering when we’re going to walk through the door and greet them with a big hug. No matter how long you’ve been gone, or where you’ve been, they’re always right there at the door with a huge smile and wagging tail. 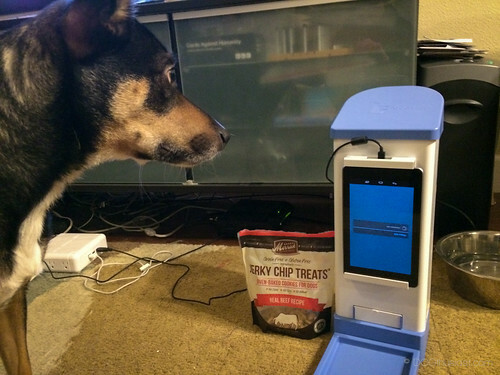 This automated treat dispenser gives every pet owner the ability to interact from their smartphone, tablet, desktop, or laptop computer as many times as they want with their favorite pet. Those of us that remember Pez candy dispensers will agree that there is some similarity to the iCPooch in looks. But,these treat dispensers also have the ability to connect to either a Wi-Fi connection or cell phone signal in the home. Of course, care must be taken to make sure a strong signal is able to be received at the point of placement in order to make sure the device is well connected. The free app to run the dispenser can be downloaded from the Google Play store if you have an Android type phone, or directly from the Apple App store if you happen to have any apple device, such as a tablet, Kindle,or iPhone.Set up is very easy, and the website has several helpful video tutorials to help explain everything with easy to understand instructions. Remember though, the computer installed in the iCPooch is only for running the dispenser and connecting to Wi-Fi, but isn’t set up to do the video chat without the addition of a tablet or smartphone. The video display, microphone, and speaker all need to be provided by the user in order to keep the price low. The software and app work to control both the computer in the iCPooch and video display device to coordinate the treat delivery and the video chat. The tablet or iPhone on the pet’s end of the conversation doesn’t need to be held in the convenient holder built into the iCPooch, it can be placed anywhere in the home, preferably perched where its camera can see the treats being dispensed. The dispenser has an interior sleeve that can be made to handle almost any kind of treat, both cookie-type and jerky-type as well. There are even small plastic dishes to dispense kibble-type treats, then the dishes will automatically stack to make room for the next treat delivery. When reading the many iCPooch reviews online it’s clear that it is a huge winner with most people. There was some grumbling at the original launch because the system wouldn’t work with laptops or desktops, but that has now been corrected. Nearly all of the verified purchasers reviewing the dispenser raved about the fantastic customer service, so if keeping in touch with your pooch all day is of value to you, you should definitely give this product a shot. Your Dog Might Need To Get Used To It. Dogs can be very apprehensive about new things. They are creatures of habit and you need to build their thrust. Here is a little video of a dog getting to know the Icpooch for the first time.